Retailers are sourcing food products from local suppliers to simplify supply chain management, save time and transportation costs, and build goodwill within their communities. In the ultra-competitive grocery channel where freshness matters most, there’s no place like (close to) home. In response, retailers are sourcing food products from local suppliers to simplify supply chain management, save time and transportation costs, and build goodwill within their communities. While there is no universal, standard definition of “local,” consumers are almost unanimous on one geographic constraint. According to recent research by consulting firm A. T. Kearney, 96% of U.S. consumers describe local food as products grown or produced within 100 miles from the point of sale, up from 58% in 2014.2Firmly Rooted, the Local Food Market Expands. A.T. Kearney. October 2015. 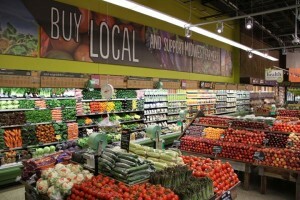 In addition, local foods now reflect a broader product assortment. Today’s consumers – especially women and young people – have come to expect high-quality local meat, seafood, and produce, as well as jams, ice cream, and bread.3Firmly Rooted, the Local Food Market Expands. A.T. Kearney. October 2015.
local, even if it costs more. Consumers associate local with “fresh”: Nearly all consumers (93%) associate local with “fresh,” the primary purchasing factor for grocery consumers.5Firmly Rooted, the Local Food Market Expands. A.T. Kearney. October 2015. That may explain why, regardless of the category, 78% of consumers are willing to pay a premium of 10% or more for local food, up from 70% in 2014.6Firmly Rooted, the Local Food Market Expands. A.T. Kearney. October 2015. Surprisingly, even lower-income grocery shoppers say they (63%) would pay more for local food.7Rushing, James. Buying into the Local Food Movement. AT Kearney. January 2013. The availability of local foods also impacts retailers’ brand loyalty, as almost 30% of grocery shoppers say they consider purchasing food elsewhere if their preferred store does not carry local foods.8Rushing, James. Buying into the Local Food Movement. AT Kearney. January 2013. The trend toward locally sourced food products benefits businesses and consumers alike. By working with local suppliers, grocery retailers simplify their supply chains, which boosts certainty and predictable delivery, and lowers transportation costs. Local sourcing can also distinguish retailers’ brands and lead to flattering PR by demonstrating their investment in jobs in the local community. Local suppliers benefit from increased speed to market by selling to nearby retailers. Also, since suppliers are literally closer to their end consumers, they can promptly apply shopper feedback and adapt their products to satisfy local preferences. 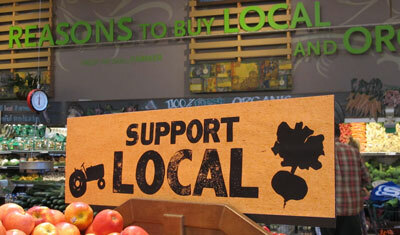 Buying local foods helps consumers feel good. Choosing products sourced closer to home allows consumers to support people in their community. These products also often align with consumers’ environmental and ethical demands and expectations. The massive growth in demand for local foods has captured the attention of retail leaders and shaped their purchasing strategies. Whole Foods Market remains committed to buying from local producers that meet its quality standards and some regional stores have an employee known as a “forager,” whose sole duty is to source local products for each store. Be authentic: To attract Millennial shoppers who lead the “buy local” movement, suppliers and retailers can help them feel an emotional connection to their brands by sharing the history and heritage of local products.11Millennials in 2015: Retail Deep Dive. Nielsen. 2015. Companies can use packaging, as well as in-store and digital communications to share their meaningful brand stories. As such, companies should proactively and transparently share more detailed information about their local products. Emphasize “fresh”: In grocery, product freshness and quality are paramount. When displaying regular and local alternatives, retailers should distinguish local products with signage that states its local origin to benefit from the perception of superior freshness and quality. For similar reasons, suppliers should use their packaging as a marketing opportunity to state the location of their product’s origin. This year, grocery retailers and food suppliers should build strategic relationships with companies in their area. To capitalize on the growing local food movement, these companies should: respect the tremendous purchasing power of Millennials; capitalize on consumers’ association between local and fresh foods; expand product offerings across categories so local foods are available all year round; and share brand stories and facts to build brand engagement and trust. How has the local food movement affected your brand? 2, 3, 5, 6. ↑ Firmly Rooted, the Local Food Market Expands. A.T. Kearney. October 2015. 4, 11, 12. ↑ Millennials in 2015: Retail Deep Dive. Nielsen. 2015. 7, 8. ↑ Rushing, James. Buying into the Local Food Movement. AT Kearney. January 2013. Lisa Goller is a marketing and communications professional with over 15 years of experience serving retail, consumer goods, B2B and technology companies. 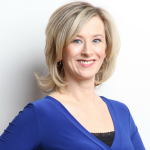 She helps businesses tell their story through irresistible content marketing and strategic communications. Also, many thanks for permitting me to comment.